What is a “Hukamnama” and the procedure? HUKAMNAMA , is a compound of two Persian words “hukam”, meaning command or order, and “namah”, meaning letter. In the Sikh tradition, historically it refers to the letters sent by the Sikh Gurus to their Sikhs or sangats (congregation) in different parts of the country during the period of the Ten Gurus from 1469 to 1708. However, now it is used to refer to the Shabd (Sacred Hymn) that is read after the Ardaas prayer is said in the presence of Sri Guru Granth Sahib Ji. In this case the word is can also be shortened to just the “Guru’s Hukam”. 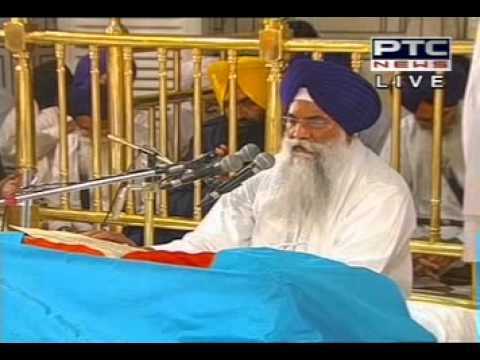 (*Hukam:- Reading or Reading out to others, including the congregation, of a Shabad (hymns) or a unit of one or more saloks (short scriptural compositions normally of two to four lines) and a pauri (short stanza of four or more lines) from Guru Granth Sahib Ji after, or even without performing, Ardaas is an important Sikh ritual. It is called “Hukam laina” (Taking the order or command), “Vaak laina” (taking the word), “Awaaz laina” (taking the voice). The hymn or unit goes by the name of “Hukam” (order, command) “Vaak” (uttered Word) or “Awaaz” (voice). a. Doing obeisance to Guru Granth Sahib Ji, respectfully, taking a glimpse of the congregation, an embodiment of the Guru’s person, and taking the command : these together constitute the view of the Satguru (Immortal destroyer of darkness, the true guru). Raising the drapery covering the Guru Granth Sahib and merely taking a look or making others take a look at the exposed Ang (respectful word for page), without taking command (reading the prescribed hymn) is contrary to Gurmat (Guru’s way). b. In the course of the congregational sessions, only one thing should be done at a time : performing of kirtan, delivering of discourse, interpretative elaboration of the scriptures, or reading of the scriptures. c. Only a Sikh, man or woman, is entitled to be in attendance of Guru Granth Sahib Ji during the congregational session. d. Only a Sikh may read out from Guru Granth Sahib Jifor others. However, even a non- Sikh may read from it for himself/herself. e. For taking the command (Hukam), the hymn (shabad) that is continuing on the top of the left hand Ang must be read from the beginning. If the hymn begins on the previous Ang, turn over the Ang and read the whole hymn from the beginning to the end. If the scriptural composition that is continuing on the top of the left hand Ang is a vaar (ode) then start from the first of the saloks preceding the pauri and read upto the end of the pauri. Conclude the reading at the end of the Hymn with the line in which the name ‘Nanak’ occurs. f. Hukam must also be taken at the conclusion of the congregational session or after the Ardaas. « What is the purpose of repeating Paath over and over again if you don’t understand it?